1) Get your plan done early, like the day before. Find out how many people and how many cars are going to the airport. Let your operations people in on the whos, whats and whens, and touch base with university or local police to find how to best get out of the parking lot or to the highway. I have been in full police details with lights and sirens all the way to the airport (SEC), and inched along behind security golf carts (Big Ten). I have been abandoned by announcers (you know who you are) and been unable to keep up with the lead car while drunken fans pounded on the hood of my rental vehicle (more than once). Every situation is different. 2) You are there for one reason only, to do the game. Getting out is secondary. You set up a turn key operation ahead of time so that you can concentrate on doing your job without logistical distractions hanging over you. Overtimes happen. Lightning delays happen. Officials sometimes slow games to a crawl. This is your career, and nobody paid you to do this game at gunpoint. On the rare occasion you will miss your planned family time or your next work assignment, just as you would with a standard-issue airline fiasco. 3) There will be no complaints. See #2. Hopefully I set a good example on this. Personally, I will not tolerate people on my crew complaining, whining, or cheering like children because the path the game has taken has affected your ability to get out. I have seen announcers and directors completely lose focus in close finishes because they had a flight to catch. You need to be a professional until the moment we are done with our responsibilities from site. This is all prologue for dateline: Salt Lake City - September 15th (and 16th), 2012. 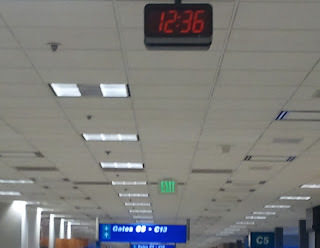 BYU vs Utah was a 8:15 MT kick, and a handful of us had the 12:55 AM red-eye to Atlanta. My GPS spat out a 9-mile route that would take 13 minutes from Rice-Eccels Stadium to SLC Int'l in an ideal world. Our stats guy was going to ride with us - he had the NFL game in Charlotte at 1 PM ET Sunday, and asked during the week what our chances were. I immediately thought of Breaking Bad Season 4, "Salud," what Mike told Jesse on their expedition down to the Mexican drug cartel as they sat by Don Eladio's piscina. "I promise you this. Either we're all going home or none of us are." You would have to think, barring some sort of worst-case scenario that we would make it out. And things seemed to be going smoothly. The game was slow but the outcome seemed assured. Utah led BYU 24-7 at home, entering the 4th quarter. But after a botched Utah punt attempt deep in their own end, it became 24-21 late rather unexpectedly. At about 11:40 MT, BYU got the ball back on their own 8 with 1:11 left and no timeouts. The game seemed all but over, but on a 4th & 12 Cody Hoffman got past a clueless defender and Riley Nelson hit him for a 47 yard out-and-up. Now there was :08 left and BYU was at the Utes' 34. They tried one play to get a closer FG, but Nelson's arm was hit and the ball fluttered. When it landed there were all zeroes on the clock and Utah celebrated. We did our due diligence, showing there should be :01 left. The replay review process confirmed this and the field needed to be cleared. BYU then attempted a 52-yard FG to tie. It was blocked. 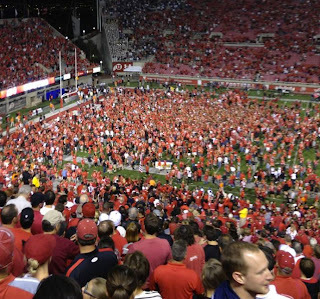 The Utah sideline and fans emptied onto the field again in triumph. Except the blocked kick bounced back to the holder, who started running. He didn't get very far - it wasn't exactly a Stanford band situation - but he dodged a couple of guys and kept the play alive long enough for an "illegal participation" flag to be thrown on the home team. That's a 15-yard penalty. BYU would have an un-timed down and a much more probable 37-yard kick to send the game into OT. And it would take a couple of minutes to clear the field once again. At that point you know the kick decides whether you have a chance to get home to your kids, or spend another night in the S-to-the-L-to-the-C and all of Sunday in the air. You can't keep it out of your mind, and you know what you want to happen, but you simply push that all aside and do your job. Then the improbable happens, the kick looks good but hits the upright and drops meekly to the ground. Utah wins and the field is deluged in red for a third time. At this point there are a handful of edgy people, since it's my car that's going to the airport. We milk the scene in the stadium, do all of our replays and reactions and get off the air right at Midnight MT. But now we have postgame responsibilities. Our reporter and handheld camera were sifting through the masses on the field trying to get Coach Whittingham. I felt a tug-of-war in my head. I knew we really had to leave if we were going to make our flight, but I also knew I had to stay to make sure the interview was happened properly. There was no glad-handing, and no "good job" farewells with the crew. The stadium had begun to empty and the parking lot was starting to look like the zombie apocalypse. We had a solo police vehicle in front of our Chevy Equinox, but no lights no sirens - a Utah state law. Now I'm a New York Driver, I've cut off plenty of taxicabs and taken my share of turns from the middle lane when pressed for time, but plowing through crowds isn't my specialty unless it's in a video game. We needed someone with a little more (how do I say this?) balls. My colleague took the keys from me. We had ignition at 12:08 MT, 47 minutes to our ETD. 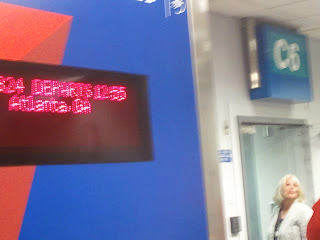 Sometimes they close the doors at 10 minutes prior to departure so we had 37 minutes to get to the gate. Backtime indeed! Sergeant Smith's guy took us out a route we didn't expect and over the trolley tracks, wound us through some side streets, and we were pretty much clear. The GPS estimate was 13 minutes and we pulled up at the rental car return in under 20. ...And reached the end zone. 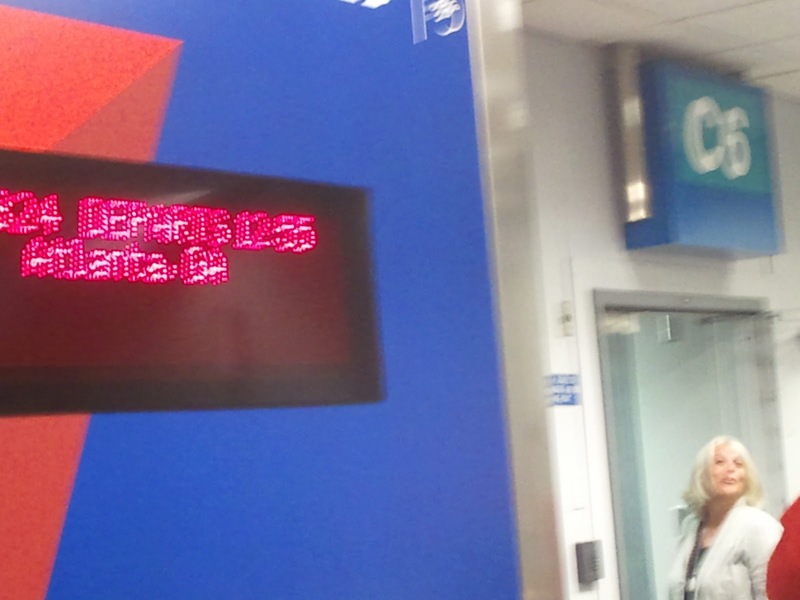 We arrived in Atlanta on schedule. I even slept a bit on the plane but there were still 3 hours to kill in the airport before my connection home. It was now 7 AM, and Sunday morning of course, which meant Chick-fil-A was closed. It infuriates me every time but that's a subject for another post, if not a manifesto. 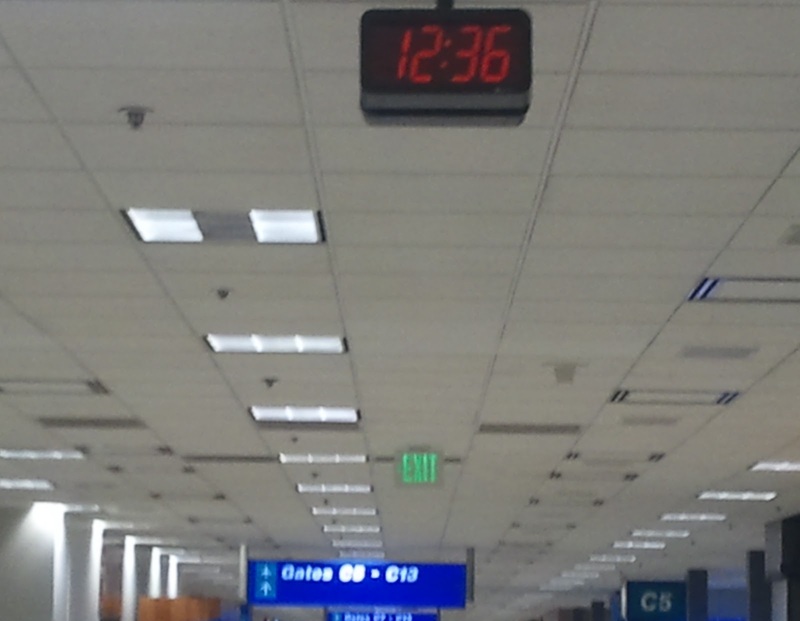 I saw highlights of the end of the BYU/Utah game several times on monitors throughout the airport. I was running on fumes and wondering if the adventure was worth it just to spend a few extra hours with the kids. I eventually melted into an open seat at the crowded gate area and audibly sighed. "Tired?" I heard a deep voice, and turned to the older gentleman next to me. He looked like Colin Powell, but was dressed like Jimmy Buffett. I told him I just took the redeye in from Salt Lake City, "and you?" Dude was retired military. He had just completed his one-year contract training Afghan police, and was headed home to Hinesville. Now that's what I call an escape.